All drivers should be familiarised with the operation of the park and shunt valves on a trailer, but when they apply the trailer park brakes, are they fully aware of why this is so critical? To be clear, there are situations where a trailer can roll either backwards or forwards with potentially fatal consequences. The situation can arise from the potential assumption that, when the air lines are disconnected, the trailer brakes apply automatically. Whilst this is strictly true, it should not be relied upon due to the way that the trailer air/spring brakes work. If a trailer is left for any length of time and the trailer park brake has not been applied, rollaway can occur when re-coupling if the driver does not apply the tractor park brakes (hand control) or carries out split coupling. 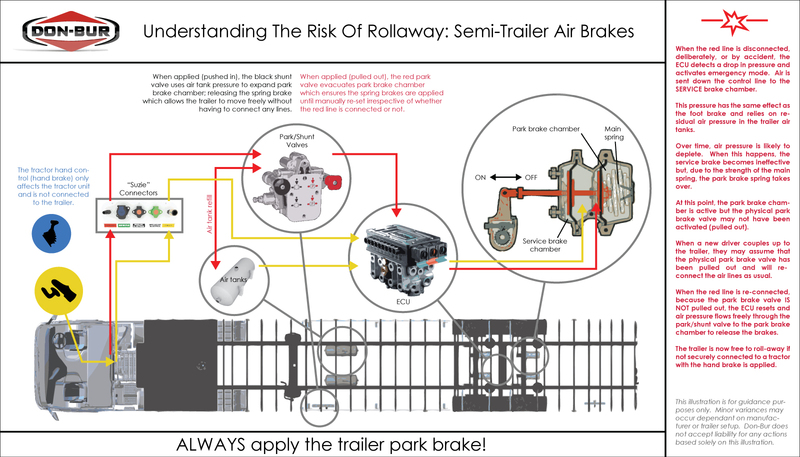 Don-Bur has produced an useful infographic to explain how trailer air brakes work and how this stuation could arise. Split coupling is the frowned-upon practice of reversing the tractor fifth wheel under the trailer bed plate just enough to support the trailer but not enough to couple positively with the trailer kingpin. This provides the driver with more room between the tractor cab and the trailer front bulkhead in order to couple up the "Suzie" lines with greater ease. Once all lines have been connected, the driver then continues reversing the tractor until the fifth wheel clamps onto the kingpin. Check the trailer parking brake is applied. Carry out visual and functional vehicle checks, and release the trailer handbrake before setting off.